Well, frustrating as the Coursera discussion boards may be, my time spent there this morning was amply rewarded: I am SO GRATEFUL to Ulrich (check out his blog: Krautblog) for pointing out an edition that is beautifully illustrated with line drawings by Otto Ubbelohde (1867–1922), which is available as a Kindle book for just $3.99: Grimms' Fairy Tales (illustrated by Otto Ubbelohde) [Kindle Edition]. Over 400 drawings! Wow! Reading Kindle books on my iPad is a favorite way for me to relax... I am so going to enjoy revisiting the tales with these delightful illustrations. Robber Bridegroom: I love this story!!! 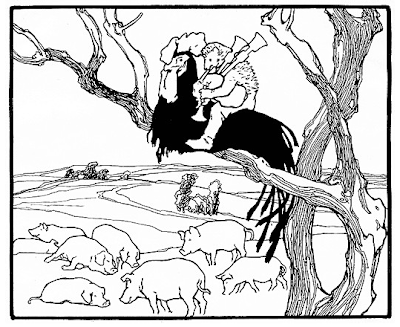 Hans in Luck: The Nasruddin of Brothers Grimm? Clever Grethel: Cutting Off Ears... or Worse!